Although many historical studies of the First World War have detailed the psychological stress and trauma endured by frontline soldiers, more research is also needed into the mental and emotional effect of the war on those on the home front in England and Canada. To what extent did deaths of sons shape the ways in which the older generation of fathers interpreted the conflict? How did these reactions affect notions of masculinity, duty and patriotism for men too old to see active service themselves? For fathers who had enthusiastically championed the war, the death of a son exposed an underlying tension between public rhetoric and private grief. 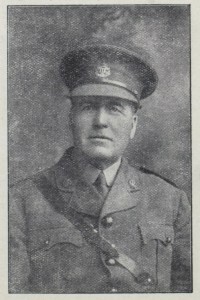 In the Christmas 1917 edition of the Hospital News, Bartholomew explained that fathers and mothers of dead soldiers, “notwithstanding their sorrow and pain, will be able to look back with a feeling of pride and say: ‘They died for God, for King and Country.’” Seven months later, Bartholomew’s views were tested when he learned his own teenaged boy was now “sleeping beneath the soil of France.”  On reading the death notice, Bartholomew collapsed. Doctors later attributed the debilitating shock to continuous overwork over the course of two years. Many of his symptoms including, “loss of concentration, loss of memory, general nervousness and marked depression,” paralleled the symptoms of shell-shocked soldiers on the front. In contrast to the patriotic certainty contained in the editorial, medical reports of Bartholomew’s condition depicted a shattered man. Doctors noted, “He is very uncertain of his actions, wandering about from place to place with no particular object in view and forgetting what he started to do.” Months earlier, as the Hospital News editor, Bartholomew had emphasized the crucial importance of relentless cheerfulness to winning the war, writing, “we must bury our individual troubles and keep smiling all the time.” “In other editions, he had called on readers not to be pessimistic lest they discourage those whose “nerves strained to the highest tension” were awaiting news from a family member in uniform. Unable to live up to his own optimistic, cheerful ideal in the wake of his son’s death, Bartholomew was admitted to the Granville Canadian Special Hospital at Buxton on October 10th 1918. Two weeks later, the Canadian Hospital News ceased publication. The final edition summed up the fate of the magazine “in three words, ‘Killed in Action.’” Invalided to Canada after the armistice, Bartholomew continued to be treated in hospital until 1920. His emotional suffering had also produced physical ailments and bodily pains. The experience of Captain Bartholomew illustrates the conflicted feelings of a father struggling to find meaning in a war that cost him his only son. As the Hospital News editor, Bartholomew articulated the popular mythology of the war as a noble crusade, and prescribed the appropriate behaviour and temperament for men on the home front and behind the lines. Supporting the war effort was the priority. Fathers needed to project enthusiasm and cheerfulness despite anxiety or personal tragedy. But when confronted with the loss of his son, Bartholomew fell into depression and indicated the fragility of this type of patriotic and masculine rhetoric. What comfort Bartholomew drew from the slogan, “They died for God, for King and Country” is unknown, but his nervous breakdown suggests that genuine patriotic zeal was no match for the profundity of personal loss. “Who Lives if Britain Dies,” Canadian Hospital News, Vol. VII, No. 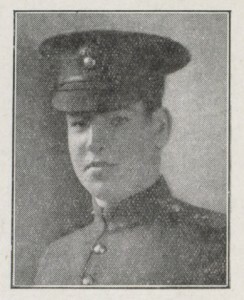 10 (2 Mar 1918). “Christmas Leave,” Canadian Hospital News, Vol. VII, No. 1 (22 Dec 1917). “Medical Board Report on Disabled Officer,” 15 Oct 1918. Robert Bartholomew. Service File. “When the News Comes,” Canadian Hospital News, Vol. IX, No. 13 (21 Sept 1918). “Keep Smiling,” Canadian Hospital News, Vol. VII, No. 7 (9 Feb 1918). “Don’t Be a Pessimist,” Canadian Hospital News, Vol. VIII, No. 4 (2 Apr 1918). “Finis,” Canadian Hospital News, Vol. X, No. 5, (26 Oct 1918). I really enjoyed this piece. So many avenues that could be explored with this topic (family, masculinity, war aftermath, mental health). Thanks for the great read! What a great peice of research, need to know more…….did Captain Bartholomew ever recover! What of his mother? Thank you for this excellent piece Matthew. Do you mind if we re-blog it on our WW1 in the Vale site? (http://ww1inthevale.wordpress.com). We are beginning to explore the effects of war on the rural home front and it is interesting for our project team to gain insight into the emotional as well as physical toll of the conflict.